Here's a Toast to what was an EPIC 2014! 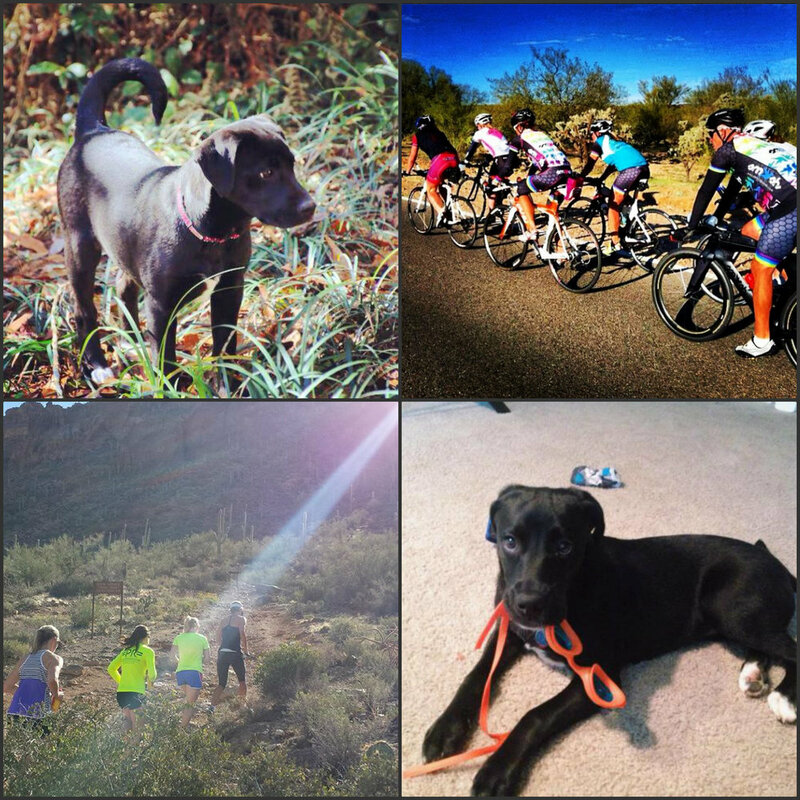 adopting one precious and precocious black lab mix. While it was still a whirlwind stop that took all of December (and finally staying in one place for more than 2 weeks at a time) to recover from, I can't say I regret a moment of it! If you couldn’t tell, my blog has been quieter this past year than most and this entire post kind of captures why! Ran the 3M Marathon to set a new 13.1 PR in 1:31! And re-stocked all of my office supplies for the new year while at it. Everything else was enjoying my first full and only mild Austin winter (well, aside from that one time it baby-snowed). Adopted my lovely Lucy on Valentine’s Day and couldn't stop raving about her for the next few months (oh, wait... I still am). Ran my 4th half-marathon with a slightly sub-par race at the Austin half-marathon but a good way to celebrate my one-year anniversary of getting hit by a car. Then closed out the rest of the month by driving clear across ALLLL of big ol' Texas with Dawn to join the rest of Team HPB at Smash Camp in Tucson, Arizona. From 110x100 yard swims (helloooo, lightning) to the most epic summit of Mt Lemmon ever (ft. snow at the top and getting stranded at the cookie cabin) to train runs through the desert and just awesome biking all around, it was the best of best #smashfests. Just one week after returning back home from SmashFest, I entered a local Texas duathlon on two days notice and won overall female—the prize was a bag of walnuts! By the end of month it was already feeling like summer—with a Friday post-work ride finishing at Sonic for a little fruit slush ending! (one of the big things I miss about Austin—warmer weather!) Lucy and I became dog park regulars and she learned how to swim with the biggest of labs. And then it turned into gorgeous bluebonnet season, my rides featuring seas of blue. Ended up spending most of my May shuttling between New Orleans, Asheville and Austin. Two weeks of Asheville hill training sandwiched the Rev3 Knoxville AG Championships where I ended up 3rd overall in their funky hybrid Olympic/Half distance, second to HPB teammate and fellow baby pro Leslie! There was also a pre-Knox moment of panic where I couldn't find my bib but got a little creative with things... Sadly there was never a race report about Knox since all of May was pretty hectic and depressing as it was spent saying goodbye to my grandmother. On the brighter side, both Lucy and I fell in love with Asheville and decided to make it our mission to move there as soon as possible. I rode every hill I could find, including a trip or two up Mt Mitchell and soaked up the Asheville love and wilderness until it was time to head back to beyond bearably-hot Austin. 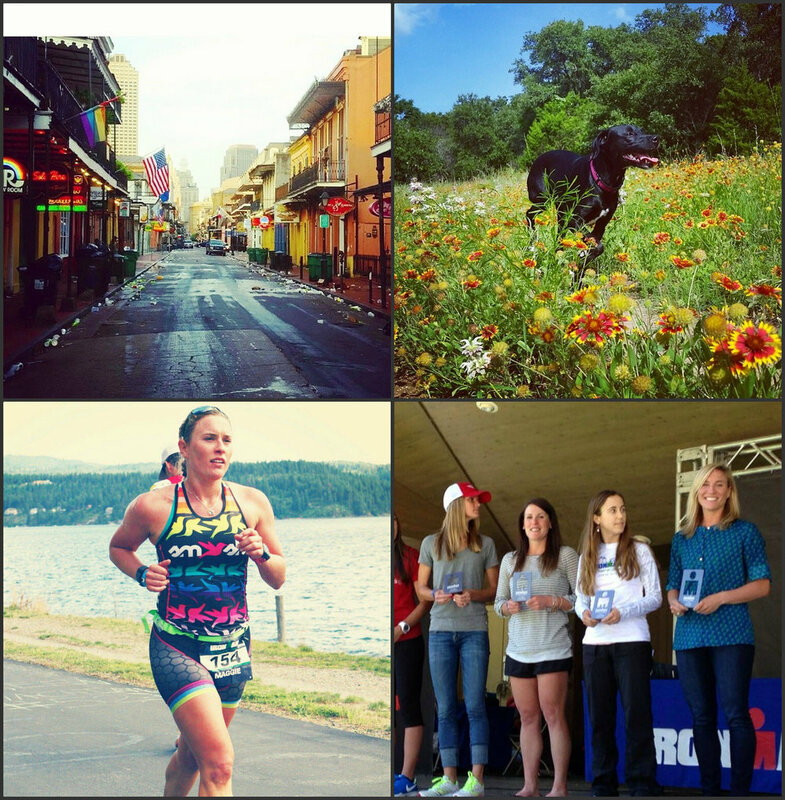 June was ALL about Coeur d'Alene, where I won my FIRST AMATEUR IRONMAN TITLE! Of course, this also meant a podium with teammate Laura and sealed the deal for a return ticket to Kona World Championships! Of course, I was ecstatic! But I went into this skeptical after a few weeks of sub-par training. Lots of driving, lots of tortured training in the Austin heat (but, oh, the sunflowers!) and lots of distractions—including a new family member (welcome nephew Lex!) and a family reunion in New Orleans, that featured a trainer ride in a stuffy hotel room while all my cousins were out partying in the french quarter and a few 5am runs down (still-beer-drenched) Bourbon Street and along my favorite streetcar tracks. Less than 20-hours after winning Ironman Coeur d'Alene I had to forget about that high since I was back in Austin and frantically packing and painting my apartment—my move to Asheville was OFFICIAL! Lucy and I drove a stuffed car 1200 to then settle into our temporary new home, a cabin in the woods with amazing views. I had less than 4 weeks to officially prep for Norseman and crammed accordingly. No lie, thistrainingwasbeyondtough. My new whip, a BLUE Triad (aka #bluecrusch) arrived and I got to set breaking her in. From there, it was off to Norway, the land of fjords, ferries, trolls, historic sea towns and churches and battle sites, beautiful views and overpriced, well, EVERYTHING! 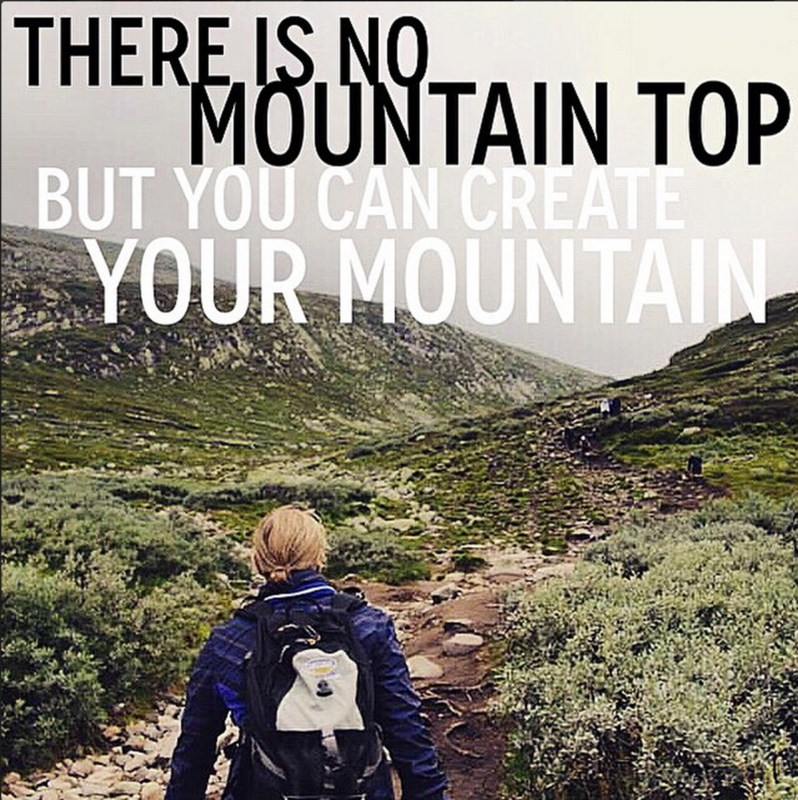 But I was here and my dream was coming true... it was time to conquer Norseman! In the race and experience of a life-time, I finished second at Norseman. Beyond that, I slowly got back into training and life was nothing but puppies and gorgeous sunsets. To be honest, all of September I was in a bit of a funk. Looking back, I barely remembering it because it was a mix of kind of quiet and kind of hectic and juggling work and training and some other oddities. I moved into a cute little house, then quickly moved out for safety purposes/it was falling apart. 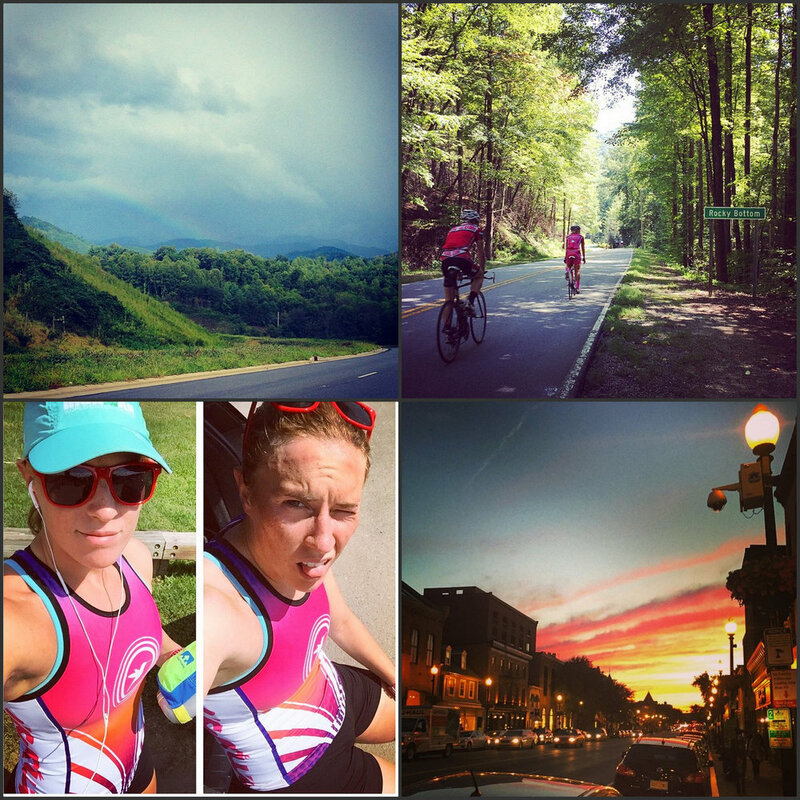 Training was all about Kona: in prep I rode with friendsElizabeth and Jared and Corey and Meghan through some killer hills in South Carolina, climbed Mt Mitchell on numerous occasions (if you ever need a fun, long route - let me know!) and got in my solo Birthday swim one weekday morning before work (set if you're interested here). All about the KONA Ironman World Championships! Leading up to it, I was on local television in a segment for being a "game changer", featured in a SELF Magazine post about the "Top Inspirational Women in the Ironman World Championships" and featured in the local newspaper with Elizabeth! In Kona, we swam the course with all of Team HPB, rode on the queen K and just in general questioned whether it would be feasible to move to Hawaii ;) Race day wasn't what I wanted but raced hard on a tough day and ended the run in an all-out duel with new friend Erin for a well-earned medal and lei—what would I have given to be able to bring the flowers back to the mainland to dry an frame somehow. To think, next time I race IM KONA, it will be in the pro race—just give me a few years, just you wait!! While the legs were still de-puffing post-race, I traveled straight from Kona to San Fran for Dreamforce, where I spoke at one of the sessions on platform adoption. While there, I also got in a few good trolley rides, got to see Bruno Mars in concert and snuck in a run in along one of my favorite routes in the world! We woke up to nearly six inches of snow on November 1st! Lucy's first snow and a shock to me as well! Along with a few other athletes, we braved the snowy day taking place in a photo shoot with First Bourn, including some of the awesome people I got to meet and ride with a few weeks before when I was introduced to this awesome venture kicking off right here in Asheville! With a quick bounce back from Kona and onto Arizona, I raced my first professional race at Ironman Arizona! Much like it was a struggle bouncing back after Norseman, I spent the next few weeks after IMAZ slowly easing into things. Lucy and I used the down-time to finally make our new home cozy, both inside and out. There was the epic proposal ride where I was the secret photog for Duran and Laura and some hilarious puppy sitting that followed. I started the project of trying to become a serioustrailrunner—emphasis on "trying". :) And to cap off all of amazing 2015 in a poetically fitting way (with a full post to surely follow shortly), I headed down to Atlanta for New Year's Eve and swam FIFTEEN KILOMETERS with the Dynamo Masters Crew. Nothing short of epic. Out of T2... Time to Wake Up The first 14-15 miles are considered “flat”… but not really. It was gently rolling with a few little climbs in there. I started off pretty solid and was ticking off the miles, warming up and removing my arm warmers and gloves and almost waiting for what seemed like the inevitable melt down. I encountered my parents around the 5-mile mark and walked for the first time. Dejected due to an upset stomach, waning energy and the earlier scare of falling asleep on the bike, I told them, “I need to slow down if I actually want to finish. It’s not looking good.” I handed them my gloves and arm warmers, no longer needed and swapped out my Nathan, which they had pre-filled with sports drink and 2 gels. There weren’t a ton of other athletes out there but there were people to focus on and chase and a few men who sped by. I knew I was in fourth place and was torn between survival and being competitive; I wanted to ask how far ahead third was, but almost didn’t want to know. Around mile 8, I saw my parents at another of our planned stops and frantically asked if there were any bathrooms ahead on course. A few minutes later they came back and shoot their head, looking concerned. Desperately, I think asked if they had any tissues, or anything…. No luck but next time I saw them, my dad handed off one of his hankies and I got a good luck of sorts. Trust me, having your own crew on a self-supported course is not as glamorous as it sounds; who wants to admit to anyone that they’ve been on the verge of shitting their pants for the past 4-5 miles? A few miles more of frantically scanning for some woods, a big boulder, anything, I found a kind-of-obscured-but-not-really ditch, cut across the road and bounded down into it. I got some weird looks from other competitors as I emerged but sweet relief and the run started to turn around dramatically. Near the halfway mark my parents started getting excited, “you’re gaining on the girl ahead with serious speed! Keep it up! !” I didn’t believe them and didn’t fully believe in myself and that I could catch her but the little glimmer of hope was all I needed and I started to step it up even more. We reached the base of Gaustatoppen and I made my pass. I was now in third and only 5,000 in elevation ahead. Zombie Hill was brutal—I made it out to be this epic climb in my mind and well, wouldn’t you know it, it basically was exactly as imagined. At this point, I was running more than almost anyone around me and was probably passed by no more than five people—but was passing others left and right. I would run for a certain amount of time or until a certain landmark or until I couldn’t take the burning in my lungs and legs anymore and then walk for an equal time. At the same time, Zombie was a blur: other than the fact that you could literally see athletes starting to unravel here and there (turning into literal Zombies), there was a funny incident where two sheep were running behind two guys running ahead of me. They ran for quite some time, a funny pack of four, and I couldn’t help but chuckle the whole time. At the start, I pulled away and I couldn’t keep up. ran for a bit with Martin, a guy I had been back and forth with on the bike, until he and his crew pulled away. The interesting thing is that starting at the base of Gaustatoppen, your crew is allowed to “run” alongside you. And so there were actually packs where one athlete had one, two, three folks running alongside for motivation, to hold gear, etc. You were even allowed to have headphones, which I might use if I return for this section for some additional motivation. As a result, I was one of the few running solo so I felt like a lone wolf running up the mountain, getting some cheers from folks as a ran past. You reach a checkpoint where you are then allowed to either continue up to the summit or have to peel off to finish at the hotel. I had no idea of standing and so when I got there, I frantically asked them about placing. They laughed and said I was “more than fine” and sent me on my way. In the elevation profile, the last little segment before the actual hike seems flat but with the wind and the exhaustion in the legs, it felt like we might as well have still been climbing up the earlier incline. I reeled in Martin, Robert his crew and one other athlete and we ran in a small pack of four across this plateau section, breaking up with the occasional walk. I have never been happier to run with a group, they shielded the wind and kept me pushing the pace when I otherwise might have wanted to walk. It was here I made my final female pass for second place. She was walking, with her crew. I made the pass and tried my best to not look back. I met my dad at Stavsro, the base of the final surge to Gaustatoppen, and he handed me my jacket and the bag pre-checked by support at the base to make sure it had all of the essentials (water, food, phone, warm clothes, headlamp, cash—though my dad forgot the cash part so we couldn’t get post-finish snacks, including WAFFLES and beer, at the top… TRAVESTY. I still give him a hard time for that). This was harder than expected; first off, the climbing. It would have been tough even without 12-hours already under the belt. My dad, really fit and used to regular steep hikes, was breathing pretty heavily and in fact I lost him for a few minutes at the very tippy top as I surged to the finish. My mom (also fit and used to hiking) had a 30-minutes head start and we quickly passed her about 1/3 from the top. Her plan was to try to get a head start and then catch us at the top but she had to give up on that plan when it was taking longer than expected. But secondly, and even worse, were the rocks and the scree. This is not—I repeat, NOT—a hiking trail. It is a boulder field with occasional markers to point the way. My tired legs were struggling and I rolled my ankles a number of times, actually falling hard on several occasional times. Then there were parts were I was literally climbing hands and knees to get up and over a big rock. For most of the way, my dad led the way and I blindly followed, my brain starting to have trouble functioning out of sheer exhaustion. My watch went dead somewhere along the way, running out of battery from such a long day. We started to encounter photogs and random hikers heading down, “how far to the top?” We heard ten minutes first, few minutes down the road it was twenty, then five. We couldn’t reach any sort of consensus on where the actual peak was—it was Imgenfjell all over again. Then the scree turned into steps, big ones. And it was step step step up to the top, cheering, a brief pause at the top to raise my arms high and celebrate—celebrate the finish? The accomplishment? Just being done? I don’t know. But my legs buckled and I staggered over and curled up in a fetal position, gone to the well, absolutely done. They ushered us into this little hut at the top of the mountain, passed out blankets and hot soup and everyone crowded into the tight space, looking utterly exhausted and shell-shocked. The good news was that the little tram down the inside of the mountain was working for athletes and so the worst was behind me, no fear of having to stumble back down the mountain. The bad news was that my dad forgot money and I was famished. Ever since the stomach incident, I had been conservative in my fueling and had been bonking my way up most of the mountain. Instead of spending some time relishing in the finish at the top and taking photos (hell, I’m jealous of the crew that brought up champagne to the top—add that to my must-do list for next time!! ), I pretty much gathered myself, nibbled at the soggy turkey sandwich my parents didn’t eat but got tossed in the support bag and then headed down the mountain. My dad had to hike down but I got to take this really cool cable railway run by pulleys that spits you out on one side of the mountain, but not where my parents had parked. With another athlete, we hitch-hiked a ride to the starting point and I took the keys my dad gave me to pass out in the car, eat yet another inedible soggy turkey sandwich and pass out until my parents made it down the mountain. We made it to our cabin, showered and then ate way too much pizza and drank too much beer and ran into about five of the ten other Americans and crew that somehow all ended up at the same pizza and beer joint in remote Norway! The next day was the awards, where I got recognized for my second place finish and earned my very own coveted black tee! If you haven’t been able to tell in the past few weeks, I still have unfinished business at Norseman. Will I try to register again for next year? Probably not, though the temptation grows with each day removed from the race day suffering. 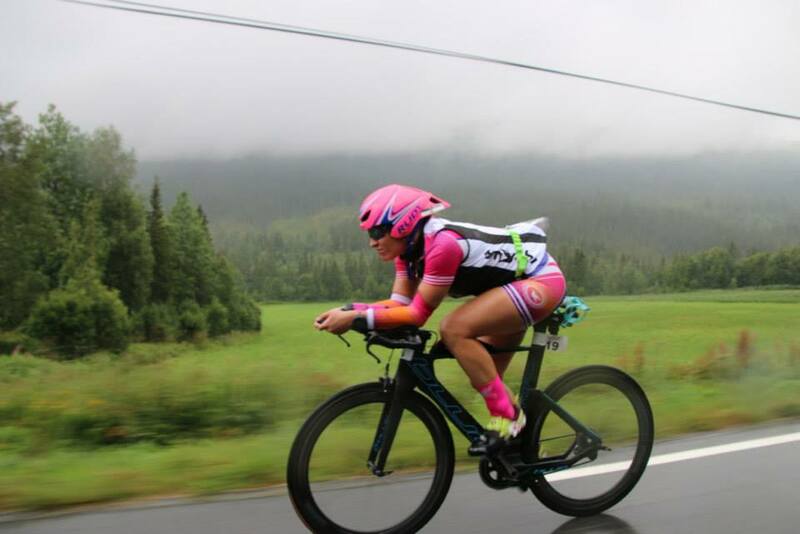 More likely I’ll head back to Norway in 2016, truly ready to conquer this monster of a race. What would it take to win? Personally I think I lost this race on the bike—I struggled on certain climbs, lacked the endurance required and then took too long to find my running legs heading into the marathon and climb. 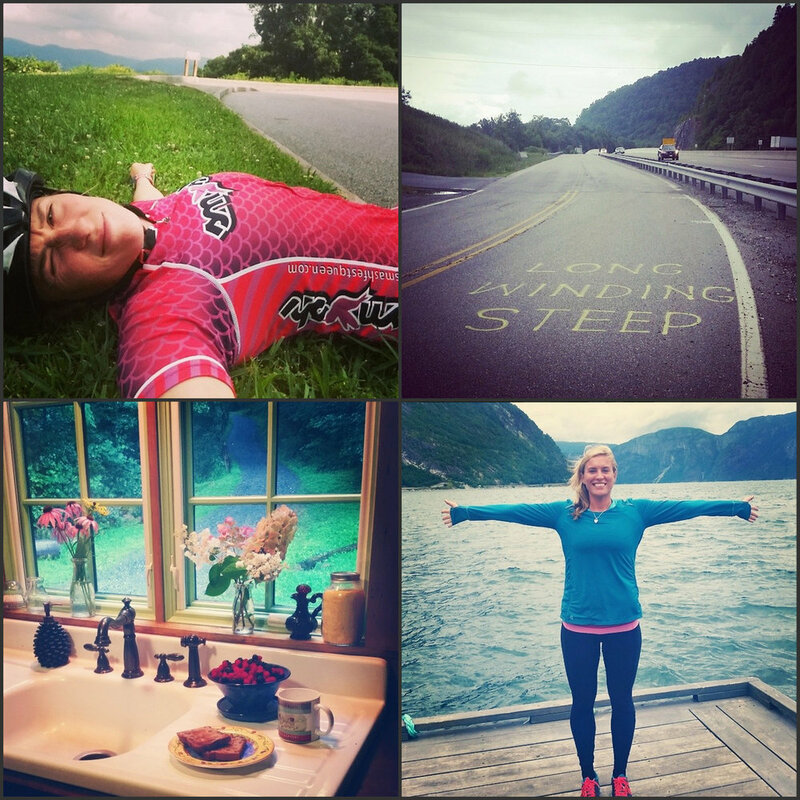 I didn’t really start race-specific training for Norseman until about 3 weeks before, after I had returned from winning the age group race at Ironman Coeur d’Alene at the end of June. I had around four bike days that included over 7-8 hours on the bike in the last two months leading up to Norseman. If I did it again, I would shoot for even more of these long haul trucker days but also more hill intervals. One workout Hillary tasked me with was a long ride that included 3x an eight-mile climb on the Blue Ridge Parkway that took about 35 minutes. I struggled with this one but think these types of workouts would be key to success at Norseman. I actually don’t think you need a lot of hilly run training going into this, surprisingly. To me, it’s almost a race to mile 13 before the route starts heading toward the heavens and then it’s an awkward shuffle of jog/walk/hustle up the incline. Sure, I made several key passes along some of the steeper portions but I think the meat of the run is in that first part. Now that I know the demands and feel of the course—something I think is hugely invaluable and a boon to all the Norwegians that race and train there year after year; there is simply no comparison to the day you’ll encounter at Norseman—I feel even more confident that I can head back to Norway in a year or few and fight for that top spot. I think few others have the capacity for suffering and sheer determination that I do and I would love to get my body, endurance and motivation to the place where the mind knows it can be. Over 12,000 Elevation Makes for a Very Long Ride The entire Norseman course is brutal but it is the bike that will break your body and your mind. You can cruise the swim or potentially even fake the run but there is nowhere to hide from the suffering on the bike. With over 12,000 miles of elevation and several major mountain passes to traverse (Dyranut, Geilo, Imingfjell being the most brutal), it makes for serious climbing, a very long day and the sinking feeling that you very well could be burning all of your matches trying to get up and over each of these mountains. There are a few miles of settling in before the first climb hits you, a climb that takes anywhere from 90-minutes to 2.5 hours for some of the faster athletes. I had ridden the second half of the route up to Dyranut several days before and did not find all too bad but the first half was tough—spending almost all of the ride in my smallest 28 kind of tough. Even in my smallest gear and even trying to pace myself, very early on was TOUGH. I got passed by a girl or two and passed a few myself as we all settled in for the long ride ahead. The most beautiful part is when you cut off of the main road and take the smaller one-lane side path, hugging the rocky shore. There's not much room for passing as you cut through smaller tunnels (all mostly illuminated though—some with built in lights, others with small fires set out by the crew) and around twists overlooking beautiful waterfalls. This really is the most majestic course but of course you're so deep in your suffering that it's almost hard to appreciate. Notice I said *almost*! There was one longer tunnel, the Mabo Tunnel, I believe about a 2km uphill climb, where cars were not allowed to pass bikes and vice-versa for safety concerns. Luckily the folks ahead of me were pretty far ahead and there were no cyclists behind me to make me worry about messing with their race. There was a photographer, however, cruising behind me who captured the Smashfest sunrise kit lighting up the tunnel. As far as support crews go, my parents were amazing!! They really stepped up to the challenge here, despite some of the logistical issues we both faced. The night before I practiced botle hand-offs with both my parents to calm my mom's both of their fears. However, during the first allowed hand-off at the top of Vorongsfossen, I got the first bottle from my dad and then reached out for the second from my mom but knocked it out of her hand and we dropped it, cracking the top. You get to the top of Dyranut and then it's flat for miles and on top of the mountain plateau. Most athletes stopped for jackets and gear at the top of the climb but I soldiered on. It wasn't too bad but definitely a touch chilly and lost some of the feeling in my fingers. I lost the pace a bit and faded back, getting passed by 2-3 women. I was impressed with the amount of back and forth as a number of girls were within seeing distance of each other and a number of passes being made. It was such a nice difference compared to most Ironman races where it's not at all back-and-forth so I hope that was a preview of the interaction and tactics to come when I step up to racing in the pro category! The only bad thing was there were times when the road was a bit rough and once my saddle bag bounced off on a big descent. I hesitated to go back due to the big descent and cars on the road, so I made the decision to press forward. But luckily enough! Within the next 5 minutes, a car (I think unrelated to the race?) pulled alongside my and shook the bag at me so I pulled over to the side, stopped and shoved the bag down my vest before continuing onward. It was a big descent into Geilo before a series of three massive climbs. The first one I maintained pace and tried to not over-grind my legs, the second I started to get into a rhythm and actually started passing a number of people and then I held on for dear life for the third, Imgenfjell. I still have nightmares about that climb!! I was surprised to be holding pace and actually pacing people on the climbs—usually it's the opposite!—but I think all my big climbs up Mt Mitchell and around Asheville have paid off. That and usually I (strangely enough) feel better the further into a ride I get! Somewhere shortly before the final climb up Imgenfjell, the eventual female winner, Norwegian Line Foss, passed me and my parents had the impeccable timing to catch it as she zoomed past. I stayed with her as long as I could, before she pulled further and further away and dropped me completely heading up Imgenfjell. This climb still haunts me. After what felt like 20-minutes of climbing, I ran across my support crew at one of our planned mile marker spots and what was supposed to be a peak and what certainly looked like one. Exhausted, I yelled ahead to my dad, “it this the top? !” He shouted as I crawled back, “I think it’s right ahead—almost there!” About six or seven massive switchbacks later, huffing and puffing at what felt like a sisyphean climb, I made it to the top of the plateau and breathed easy, knowing it was all downhill from there. The next time I saw my dad I yelled at him that he was fired for any directions—his "almost there" was NOWHERE near the top!!!! But the joke was on me. While the elevation map showed the summit of Imgenfjell as the apex before beginning our 20 mile descent down to T2, the winds had other plans. The clouds and fog rolled in, it started to pour and we were greeted with a stiff headwind to grind in my easiest gear on what should have been a respite from all of the earlier climbing. I had pushed harder than I would have otherwise to this point, thinking that the downhill would be enough time to flush out the legs, recover and be ready to run. I was running on empty and motivationally down and the weather wasn’t exactly helping. We made it across the plateau and to the downhill section—where it would have scary to bomb down in crystal clear conditions—that became even more sketchy with the pouring rain, low visibility and rush of support crews trying to speed to T2 after making their last bike had-offs to their athletes. Some of the switchbacks were so tight and slick that it was hard to imagine yourself not careening off the edge! The last 20-miles went on forever. Around mile 95, I started to get really tired. I was pedaling hard and exerting energy but could not keep my eyes from drooping. You know that thing where you’re trying not to fall asleep in class or in a boring meeting and your head keeps bobbing as you nod off? I was doing that, except instead of being in a boring Biology lecture, I was speeding 20mph down twisty roads in the rain. I was pinching myself, singing at the top of my lungs, even slapping my face a few times but I couldn’t keep myself fully awake. Finally, I hit a bump and my arm slipped off the elbow pad, jerking me back alert. At this point, I realized I was soaking wet, freezing and just ready to be D.O.N.E. I rolled into T2, for the first time ever completely unsure whether I would be able to finish a race. To add to the panic that my race was spiraling out of control, my parents were nowhere to be found. The Norseman crew has about two dozen temporary racks set up in a grassy area so I rolled myself to one, sat down shivering, and started to wonder what I was going to do next. The amazing Norseman race crew came over and gave me a blanket and water and tried to calm me down by saying that everything would be fine. In the end I was on the bike for over 7:04, just four minutes over my goal time of breaking seven hours. And yet there was still one more mountain to summit ahead. Ferrying to Nowhere Racing an Ironman already makes for a long day but it becomes even longer with Norseman. For starters, the elevation and off-road hiking tack on an extra 2-4 hours alone as you have to make your way up and over and to the top of mountains. But there’s also the 4am ferry departure to allow the ferry to cruise out to the middle of the fjord for an insane 5am start. I was up later than I hoped, prepping the support car, putting on our stickers and making sure my parents were comfortable with the new set of tasks I had asked them to tackle as my support crew. Restless and running on no more than 2-3 hours of semi-solid sleep, the alarm went off at 3:15 and we rolled down to transition. The actual checking in took longer than expected as we waited in line and volunteers double-checked that we all we had lights and reflective gear for the first series of tunnels leading up to Dyranut. By the time I racked, most athletes were getting ready to get on the ferry and there were zero bike pumps I could find to borrow. Someone yelled at me to get on board and so I did, no clue about my tire inflation—gone un-pumped for over a week, I cringed thinking at how low they most likely were but there was nothing to do about it. We lined up to climb on the ferry, waving to spectators as we boarded, more like we were being sent off on ship across the Atlantic rather than heading out to do a race. The whistle blew and the ferry steamed out into the dark. You could head upstairs into the warmer and cozier ferry seating but lemming that I am, I stayed in the hull with the majority of the other participants, soaking up the shivers, nervousness and hollow eyes of the athletes around me, anticipating the rough day that waited ahead. The minutes ticked by and there were cameras everywhere, occasionally snapping you out of your daze when your eye accidentally caught their lens, before looking away and trying to act normal—whatever that means at 4:30am on a ferry in the middle of a Norwegian fjord as you’re about to embark on one of the toughest endurance races in the world. The engines shut off and the barrier lifts. Race directors herd you to the edge of the hull as we wait, crowded, trying to see into the dark and find the lights of Eidfjord somewhere in the pitch black we’re about to swim toward. The first athletes leap in and you edge up to platform. It’s cold, windy and it’s hard to tell exactly how far the leap down is—and whether there’s any unsuspecting athlete waiting down there. A space clears, a deep breath, a jump out. Not to disillusion you, but the leap is someone anticlimactic. Maybe it’s just because I’m a fan of the high dive or have been cliff diving in Jamaica but it was not as intense as they make it out to be. :) We swam the few hundred yards out to an imaginary starting line between kayakers lined up in the fjord and waited for the starting signal as the sun began to rise. Normally the washing machine of swim starts terrifies me; it’s violent and unsettling and seems like a massive waste of energy. This was GLORIOUS. Hillary had warned me that the Europeans aren’t exactly known for being great swimmers so between that and the smaller number of participants, this was actually a very pleasant swim, as far as swimming 2.4-miles can be. It was relatively warm, for Norseman standards. I opted to skip booties or any special caps and was comfortable—minus some numb toes in the last few minutes of the swim and coming out of the water. Very early, I jumped onto the feet of a pack and settled into a comfortably uncomfortable pace, both working hard but also enjoying the direction and draft of the 2-3 athletes ahead of me. Had I been solo, with my sighting skills, getting back to the speck of a town through the dark would have been hopeless. For about the first half of the swim I was enjoying the train, occasionally upping the effort when I dropped off the back and then easing back into the steady rhythm of the group. Somewhere around the halfway point, and I don’t really know what prompted it, I looked up slightly and realized my feet were nowhere to be found. Maybe 50-feet ahead the group had broken up and so I put a serious effort into closing that gap. Nothing worked, however. I was left to swim all on my lonesome and actually start sighting again. The best part was that we were told to hug the shoreline (“slightly less current than the middle of the fjord”) so with each breath to the right, I could see the road into town, the occasional cluster of spectators and comfort that I had an escape from the imaginary monsters lurking at the bottom of the fjord. We reached the boat that we were told was the turning point to cut back toward the finish. I misjudged this a bit and so ended up swimming more than I should have but finished strong, catching up to an earlier group that either took a better line or had faded across the back half of the swim and ran up out of the swim finish. This was the first time I've ever had a "support crew" in transition, which was interesting. Not sure how much help my dad provided in there with me but good motivational support! He helped me pull on my cycling gear, turn on the required front and rear lights for the tunnels as well as the mandatory reflective vest before I headed on my way!